Blue Frog's Montana BBQ burger: "It's a good height," restaurant manager Lee Mitchell said. We were a little surprised by how few of our Chinese colleagues had ever eaten a hamburger. Apparently, it just doesn't sound all that tasty to them. Besides McDonald's, no one even knew where to go to get one. Well, after a little research, it turned out that Beijing does have a burgeoning hamburger subculture, mostly maintained by laowai. After compiling a list of places with the best reviews, we were ready to have us some hamburgers. First stop: Blue Frog. Blue Frog got its start 10 years ago in Shanghai and has since expanded to Macau and Beijing. We went to the Sanlitun branch in The Village (there's another in the Europlaza in Shunyi), which is one of the places for expats to be. Stepping amongst its buildings makes you wonder if you're even in China anymore. Blue Frog wasn't trying to put you back in, either. "Mostly it's just a little escape from China," said the manager of Sanlitun's Blue Frog, Lee Mitchell, about the restaurant. "It's just going to be a little piece of home." Still, Amber Hsiao, Blue Frog's communications executive, said the place attracts both expats and locals in equal numbers. Their menu is in both English and Chinese, and their staff is fluent in both languages, as well. As a caveat, Hsiao added that their customers are usually white-collar professionals who live in the area, people who are more educated and familiar with Western customs. And, yes, lots of locals who come do order their hamburgers. Ling, the head chef who trains all other Blue Frog cooks, explained how he makes Blue Frog burgers while I watched him make my Montana BBQ burger: "We always import beef from Australia, so the beef quality is really good…Meat quality is very important." So is temperature: "When you make the temperature really [high], you…let all the juices in the burger not go out; so when you eat the burger, it's really juicy." Medium is the rarest they go (like North Carolina! ), and they char-grill their patties. "We've been using the same recipe for years," Mitchell said. "Because we've been open for 10 years, it's given us plenty of time to get that recipe right." First things first: the Montana BBQ is a really tall burger. 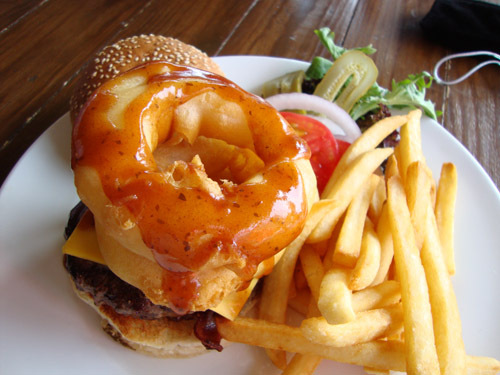 Layered with bacon, a slice of American cheddar, a thick patty and two even thicker fried onion rings, then drizzled with Blue Frog's special barbecue sauce and all sandwiched between two toasted sesame buns, the burger was more cylindrical than disc-shaped. That's before adding tomatoes, pickles and lettuce. Squashing it down without making a huge mess and then getting my mouth around it was a big challenge, which also is a good indicator of a great hamburger. I loved the toasted buns – a must for such a juicy patty. Despite the bacon and fried onion rings, the burger wasn't all that greasy and didn't feel dangerously unhealthy. They were a welcome addition that gave a hint of crispiness and a kick of flavor. But the flavor was really all patty. I wish there had been a more charcoal-y flavor to it, seeing as how it was char-grilled. At 80 yuan (US$11.71), though, Blue Frog's Montana BBQ burger – even with a high meat-to-bun ration – is a little pricey. A couple of less expensive options, the Blue Frog Burger that got the place started and the Veggie Burger, are still only 10 yuan cheaper. All are served with fries. Are they worth it? "You're not just paying for a burger, you're paying for all the service, the environment and everything else that goes with that," Mitchell said. "We've got some of the best service in the city." These are nitpicky complaints. The service and atmosphere were stellar, which goes a long way for foreigners who will never get used to the (lack of) care they get at Chinese restaurants. You might not be able to get the exact hamburger you want, but you will get a decent one. And Blue Frog burgers are unique. They are pricier than your average Chinese meal, but most foreigner-frequented places are. Most importantly, the burgers were all-American, all good. Blue Frog sets the bar high for its rivals.